Help the Museumscenter Hanstholm find this stolen piece of a German 10.5 cm S.K.C/32. Earlier in August it was stolen. 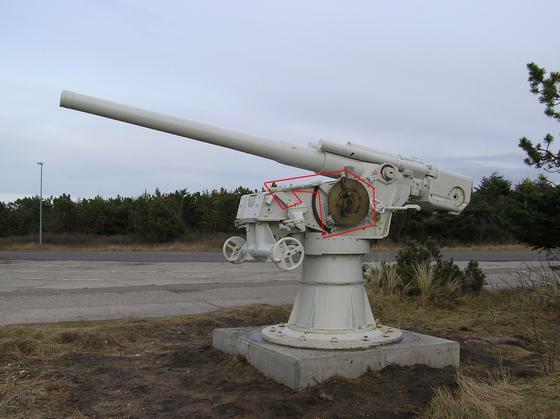 Earlier this month a part of one the 10,5 cm S.K.C/32 in our outdoor display at Museumscenter Hanstholm was stolen. It is somewhat large gearbox of iron with a brass disc on it – see photos. On the brass disc there is following inscription: “10,5 cm Ubts. u. Tbts.Flak L/45 … in M.P.L. C/30 Nr. 1122”. As it has been dismantled without the use of a disc grinder, I presume it has been stolen by a collector. It ought to be easily recognisable due to the serial number, so if you should come across it IRL or on line, please notice me.